The Vermont Holiday Festival returned to the ballroom at the Killington Grand Hotel in its 12th year on Dec. 2-3. One hundred uniquely decorate holiday trees filled the venue with sights, sounds, and scents of the holiday season. Children and adults alike strolled the aisles with “ohs” and “ahs” at the sight of the beautifully and creatively decorated trees. A larger-than-life Cookie Monster tree adorned in blue lights, carpet arms and feet, complete with chocolate chip cookie ornaments stood in the corner, making for a favorite for many children. Bags upon bags of food donations were collected Friday night as admission was free with donations of non-perishables. The Jack Frost Marketplace was full of local items available for purchase, such as Vermont maple syrup and products, bird food wreaths, glassware, and more. Musical performances were given by area schools, as well as local bands. Two large draft horses pulled a wagon through the snow, full of blanket-covered passengers enjoying an enchanting ride in the cool air, with snow falling into the evening. Santa’s workshop drew crowds of children dressed in elf hats and aprons eager to decorate their own ornaments to take home. 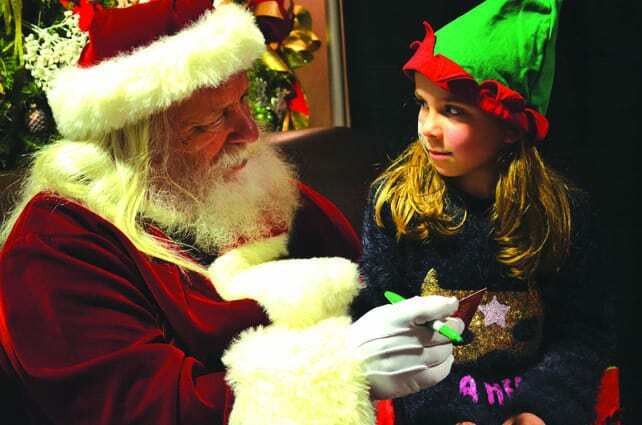 They anxiously awaited the visit from Santa himself, who sat with each child and asked their Christmas wishes, and put many, if not all of them, on the “nice list.” Many festival-goers could be seen with faces painted as reindeer, the Grinch, snowy owls, and other novelty ideas. For more information, visit killingtonpico.org. Fiona Harrington expresses her Christmas wish list on Santa’s lap at the holiday festival, Saturday.